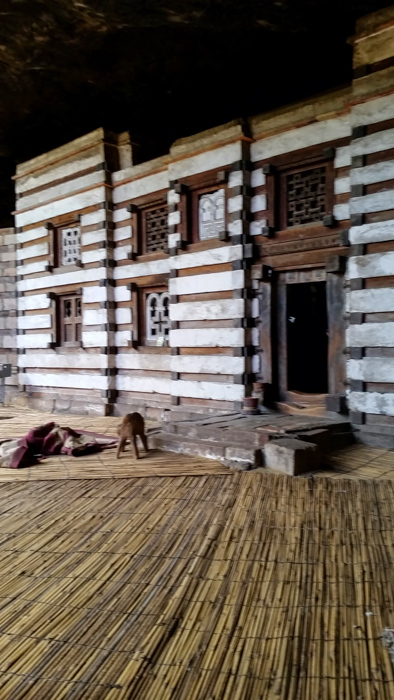 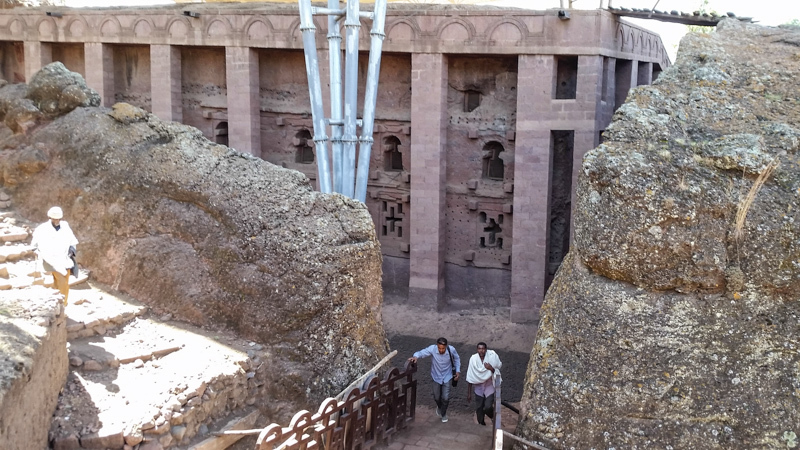 King Lalibela (1181-1221) moved the capital from Aksum to here. 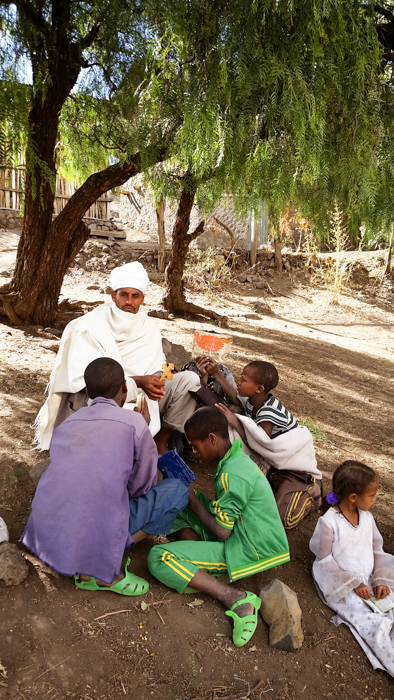 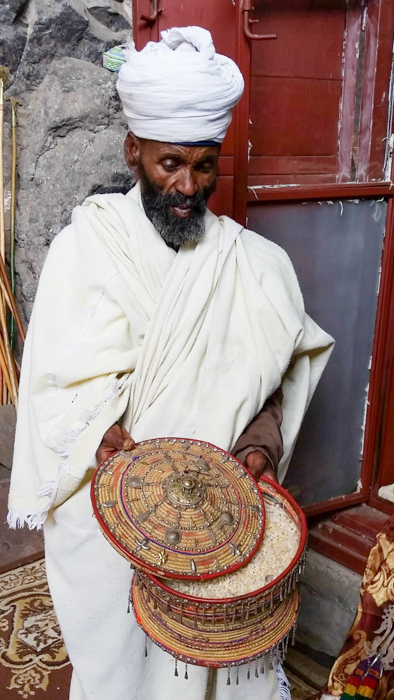 When he was born his mother saw a swarm of honey bees around his mouth revealing that he would be a holy man so named him “Honey Eater” that is Lalibela. 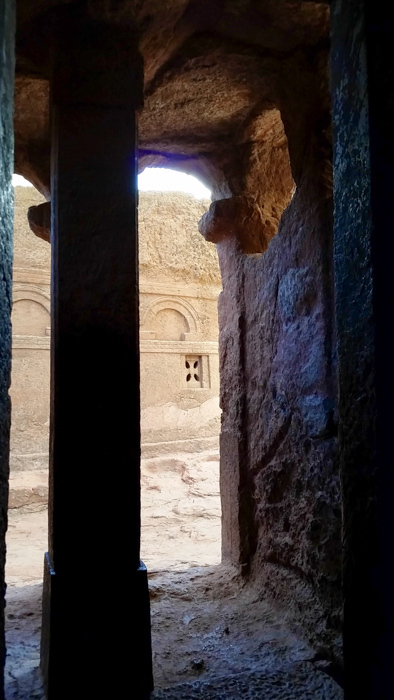 He made a pilgrimage to the Holy Land and so on his return he decided to carve churches out of living stone and create a Holy Land in his Kingdom where his people could pilgrimage. 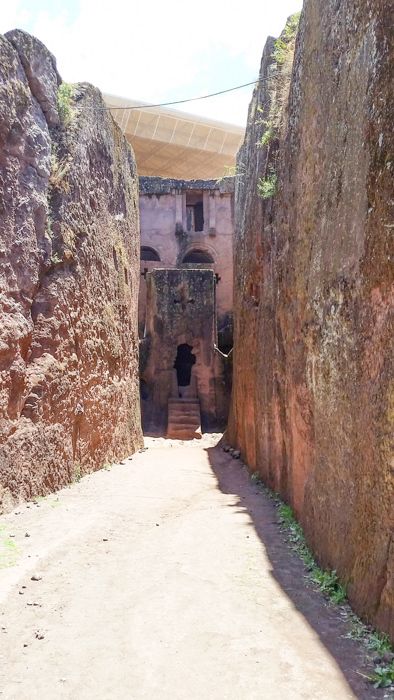 The site is impressive and has been declared by UNESCO a World Heritage site http://whc.unesco.org/en/list/18 so UNESCO built roofs over the structures to prevent further deterioration and continue to finance its restoration. 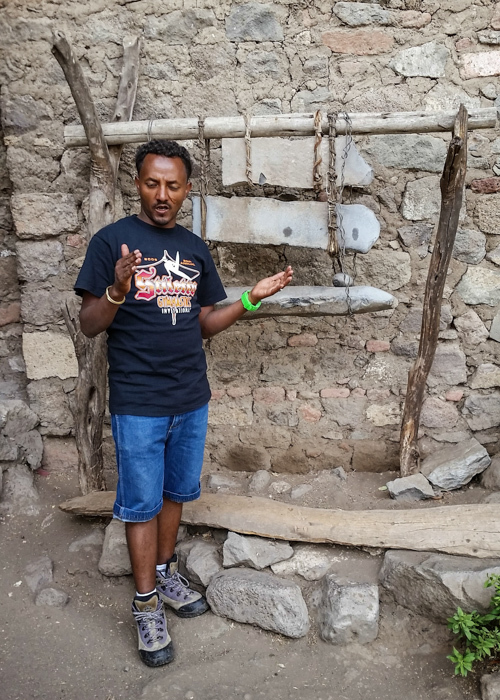 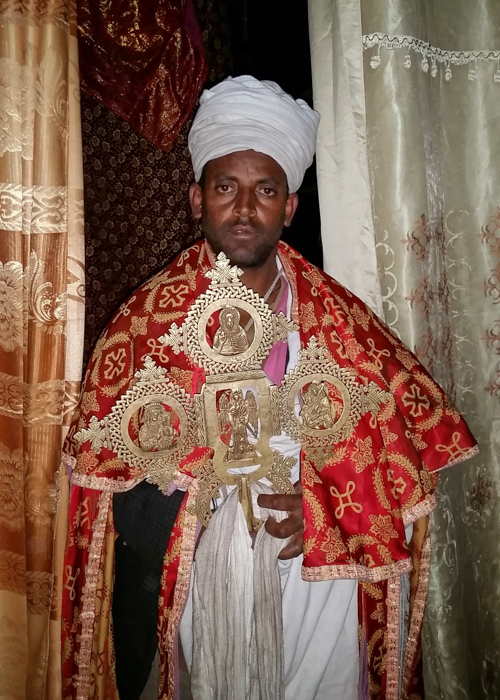 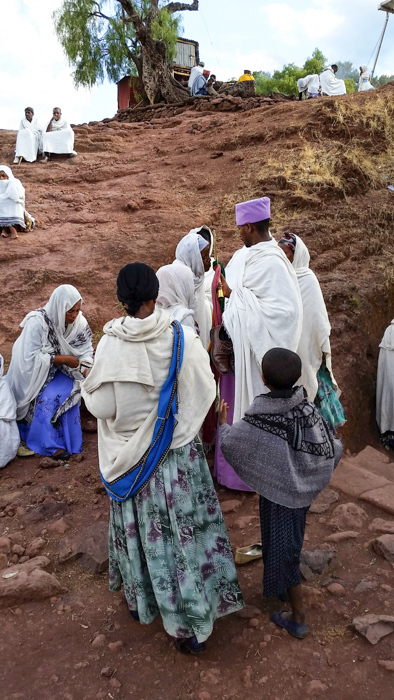 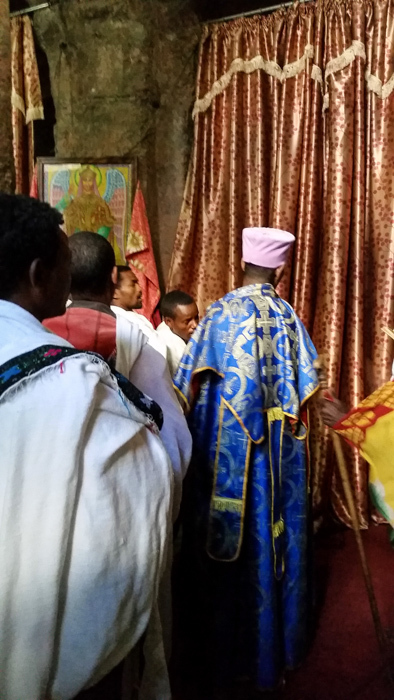 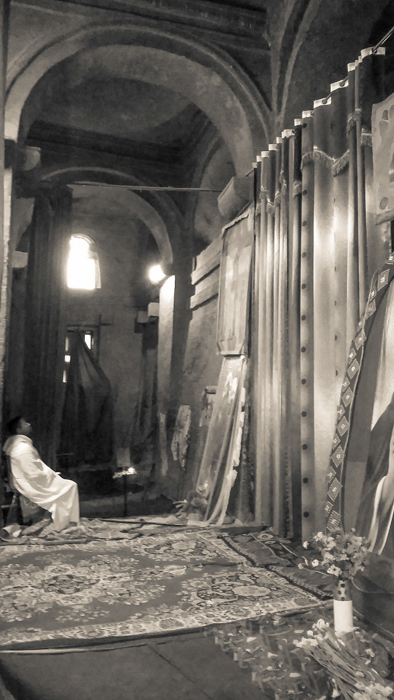 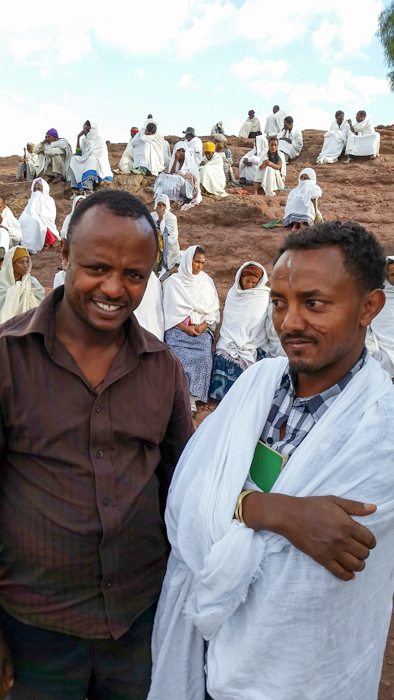 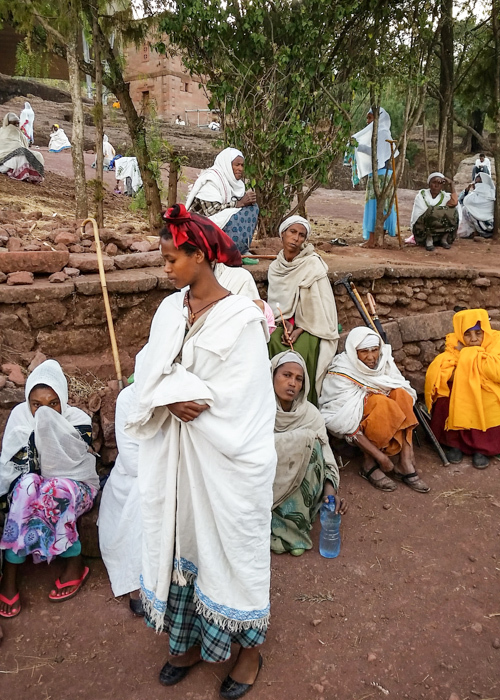 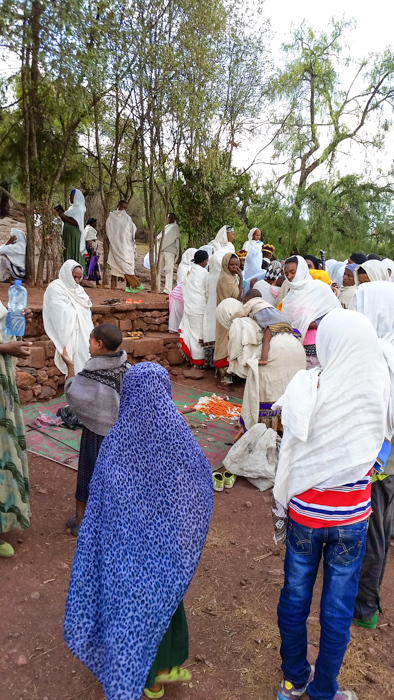 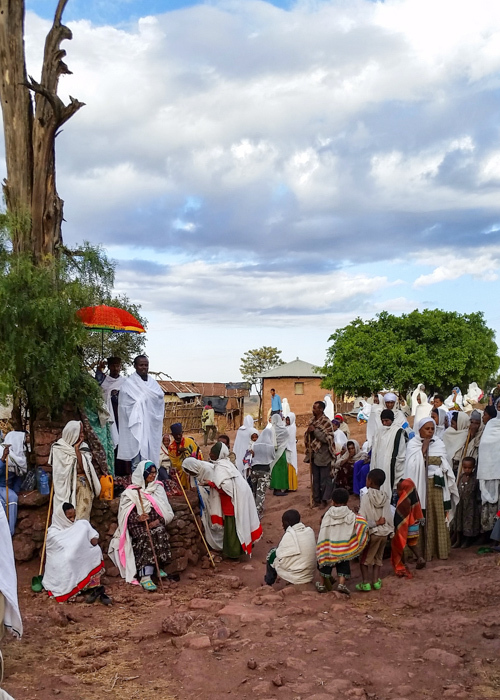 These churches continue to be the center of Ethiopian spiritual life. 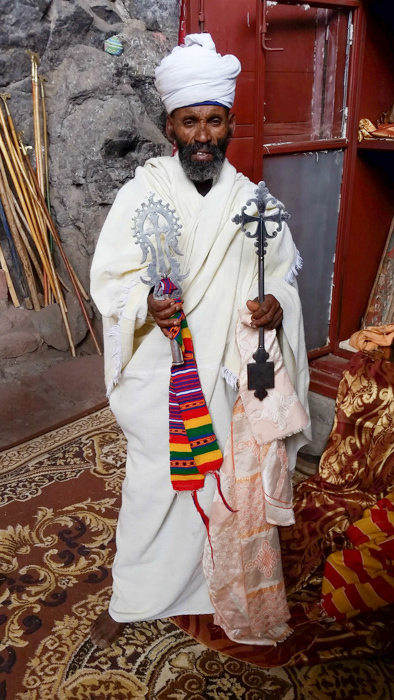 My guide is excellent. 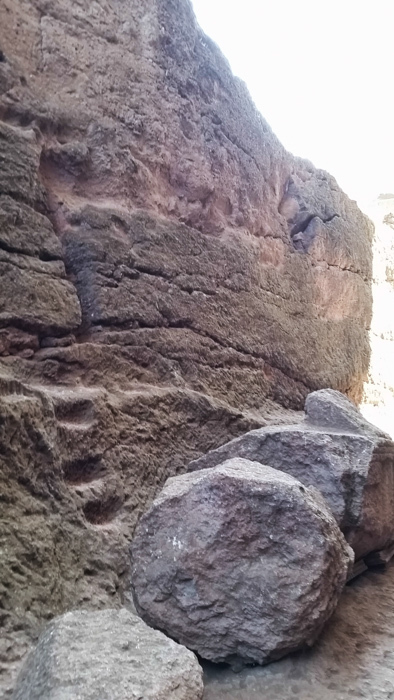 The best way to unfold this mystery in stone is to have you walk with me through the wonder of creativity and imagination. 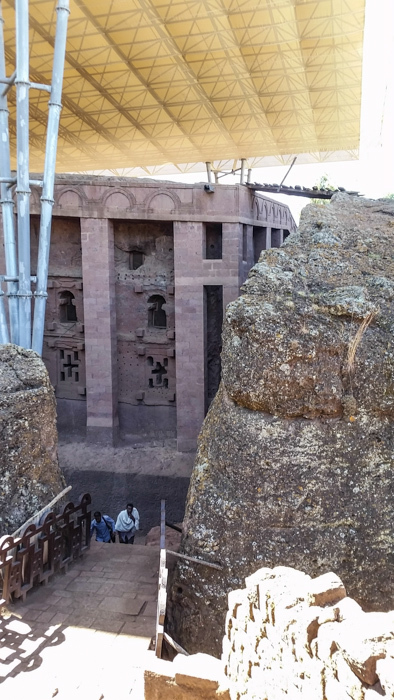 when you realize these are not constructed but hewn out of rock. 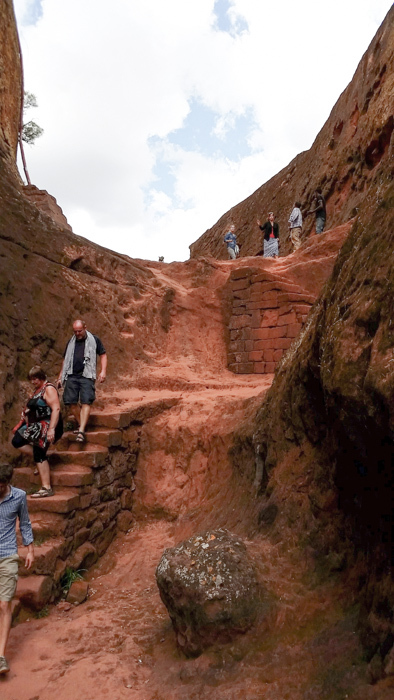 Descending to the church of the Savior of all Nations. 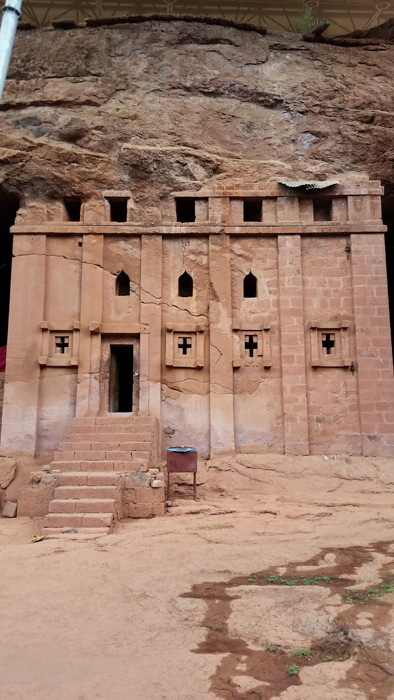 This is a monolithc church carved out of stone. 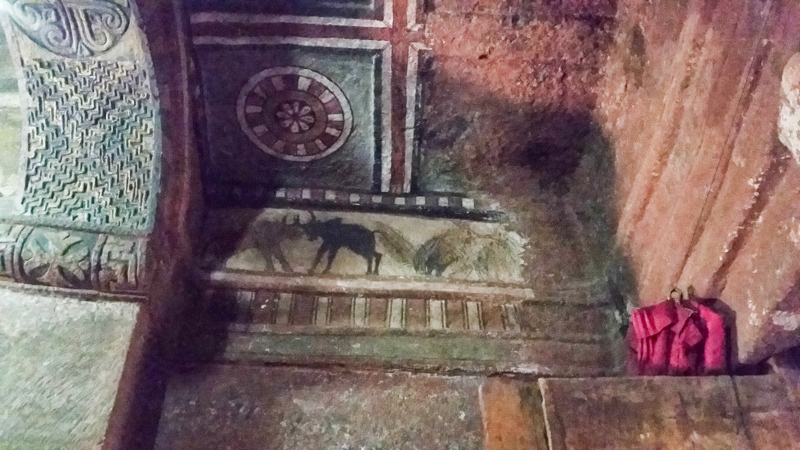 He traced out the design on the stone ground then excavated. 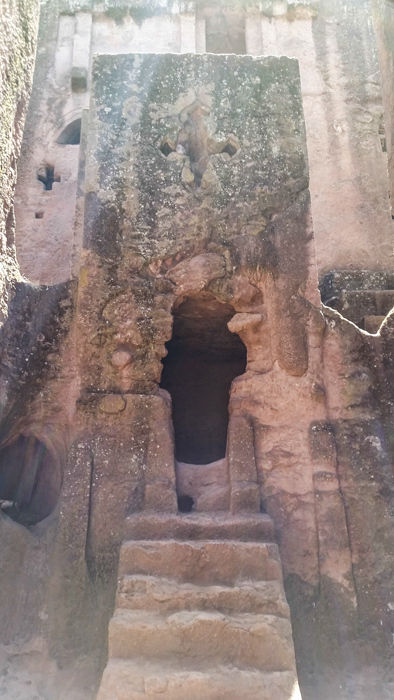 Then he excavated by carving a door then worked from bottom up to carve out the interior. 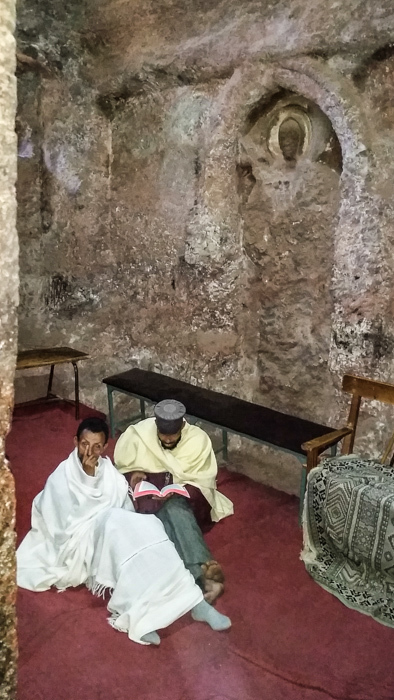 This is the rock from which the church was hewn. 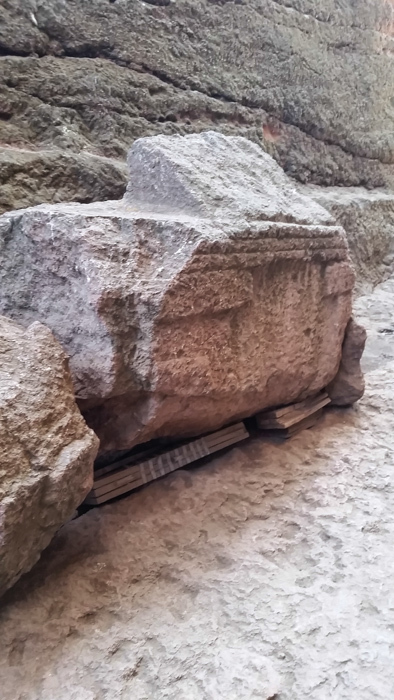 The fallen column is original. 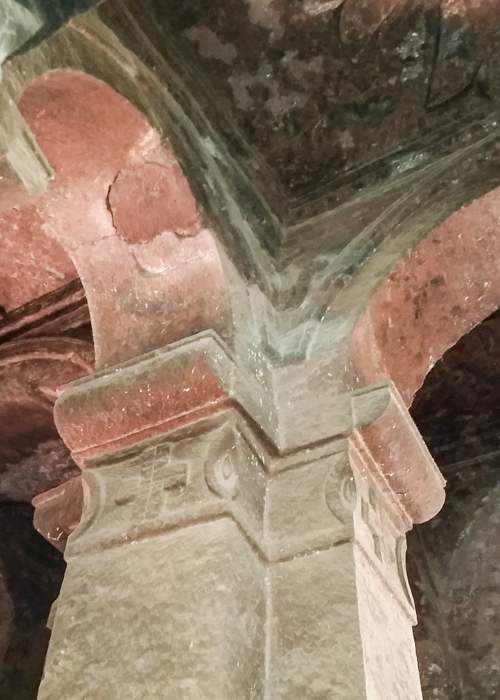 Some columns have been replaced. 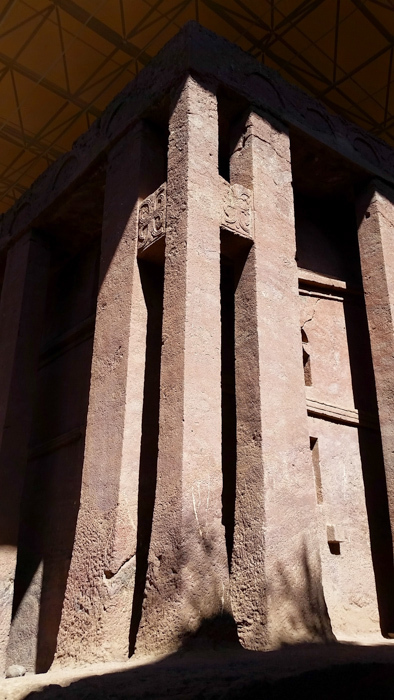 The guide pointed out there are 72 columns that represented the 72 disciples the Lord sent out: 34 outside and 38 inside that support a central barrel vault and four flat roofed side aisles. 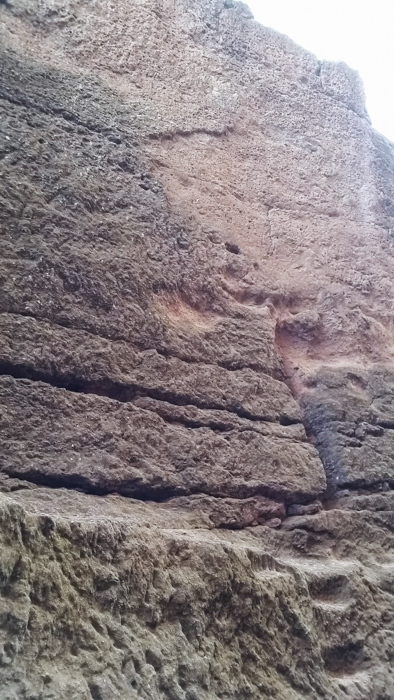 This is rock from which the structure was carved out. 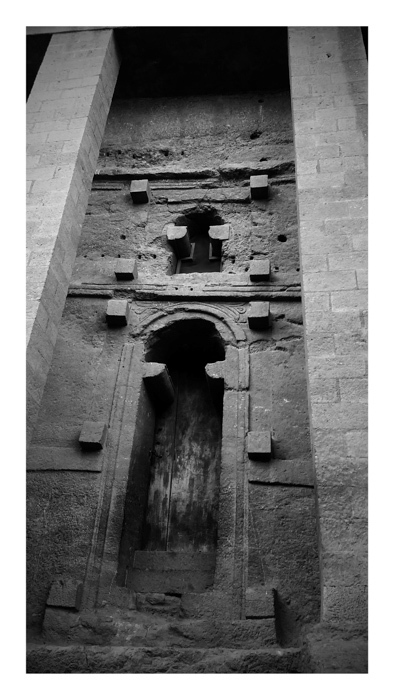 The door and window were hewn and modeled after Aksumite architecture. 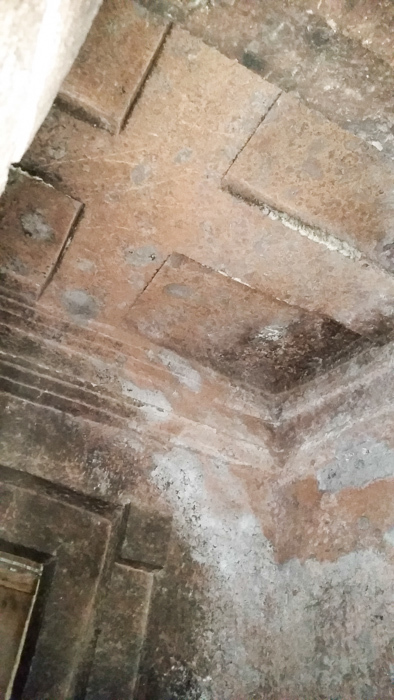 Good detail of door; columns are not original. 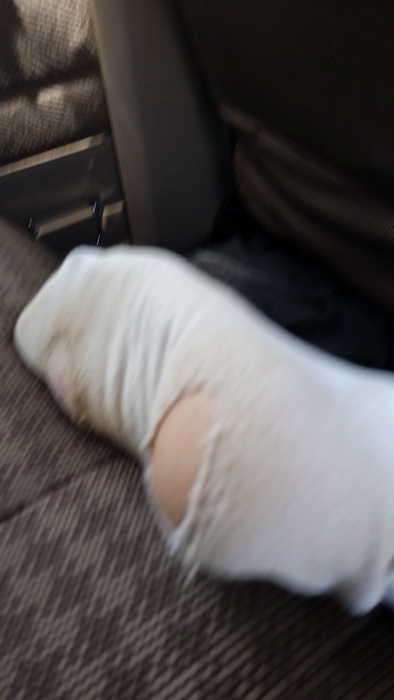 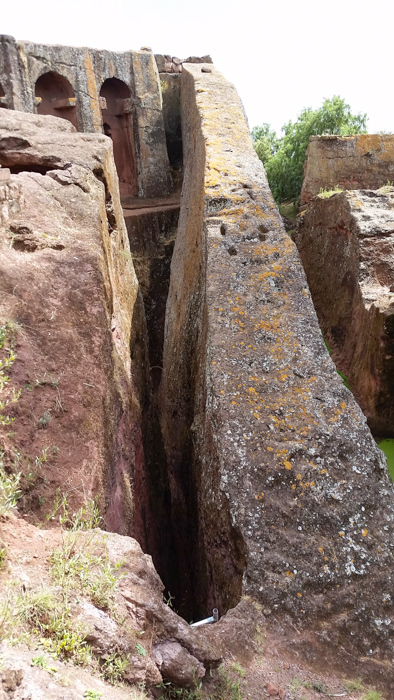 They collapsed during an earthquake. 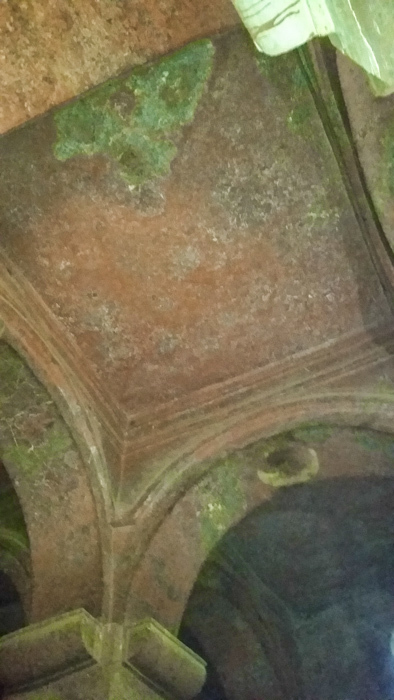 Another view of the stone from which the church was hewn. 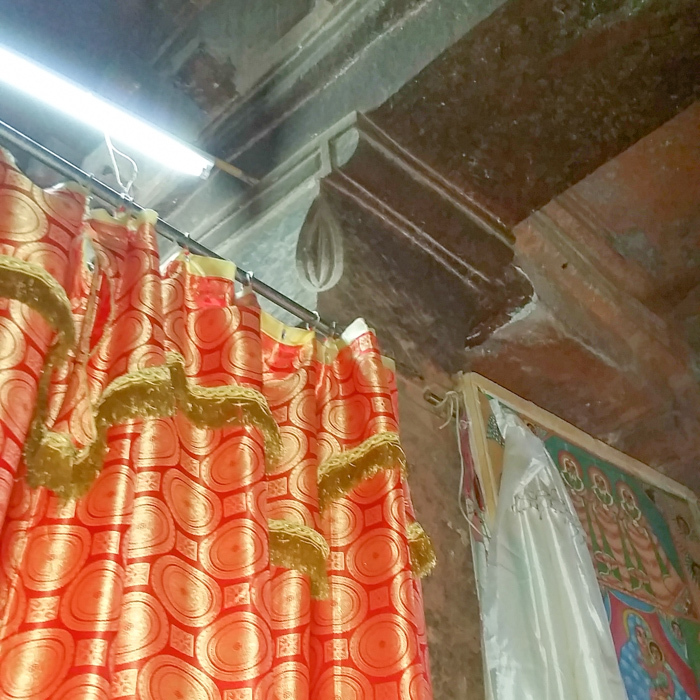 These are original columns. 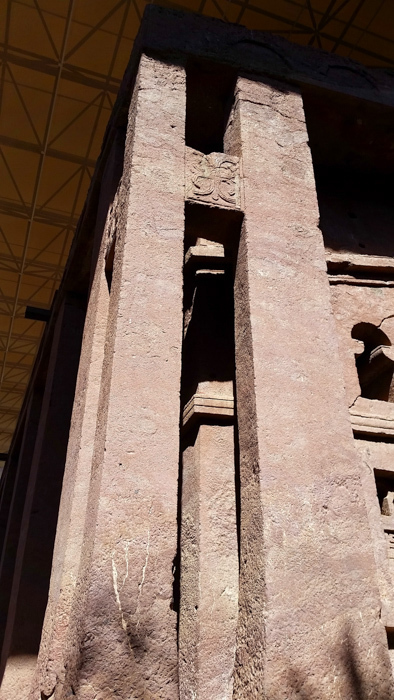 On each corner are three columns representing the Trinity. 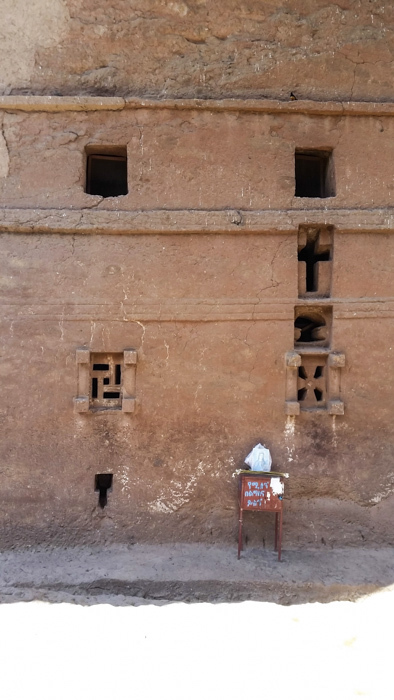 Each corner represents an evangelist. 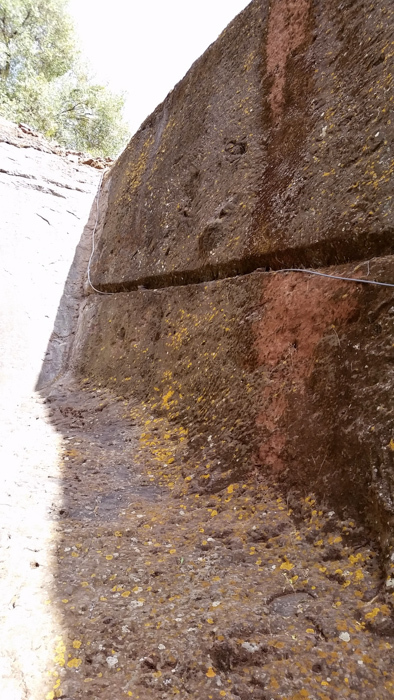 This gives a good contrast of an old column on right and new on left. 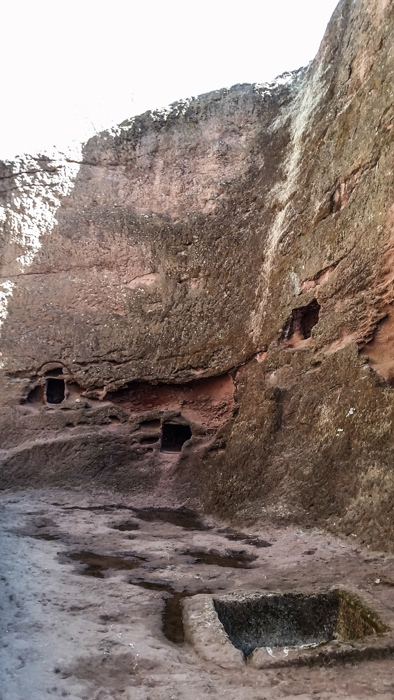 Notice that the windows are hewn out of rock. 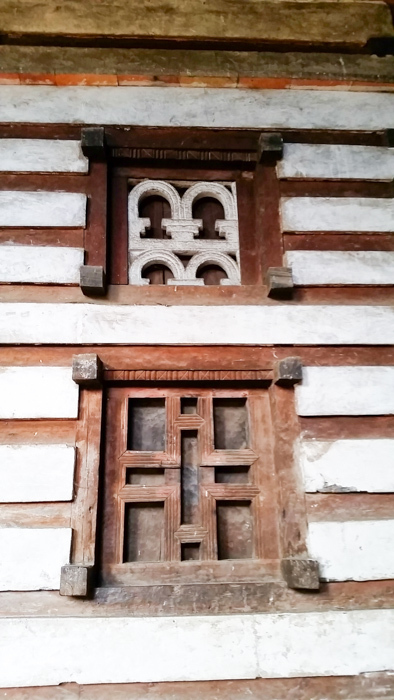 Good detail of windows carved out from within. 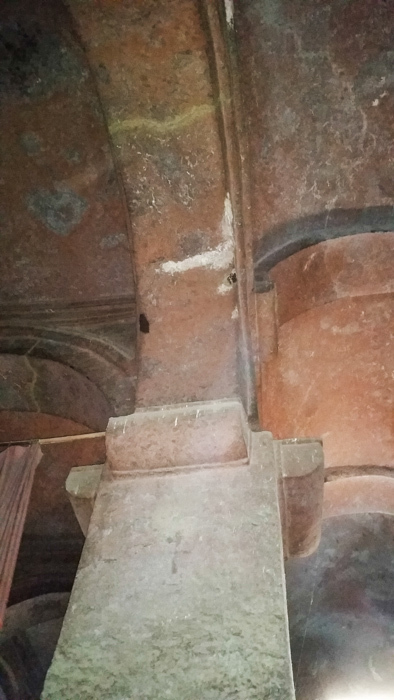 Good view of the hewn capitals. 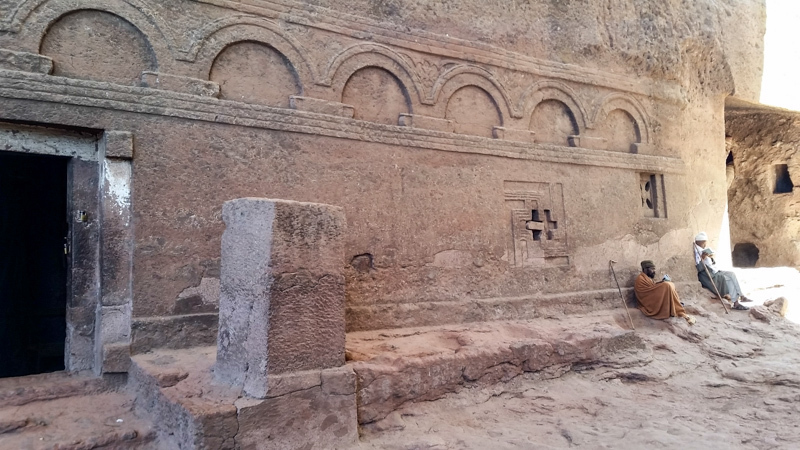 The three carved tombs representing the tombs of of abraham issac and jacob. 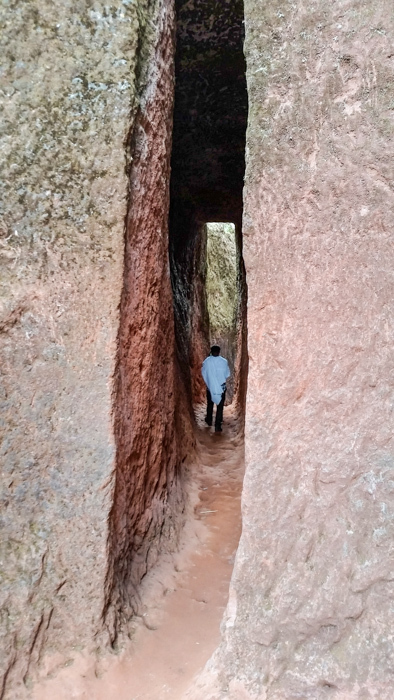 This is the tunnel that leads to Bet Maryam which is a perfectly proportioned church. 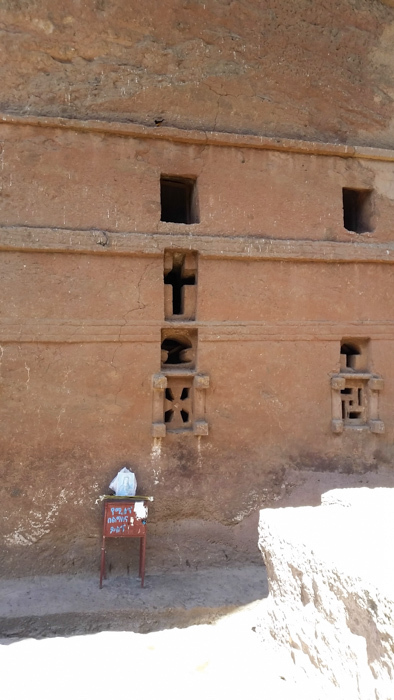 On the eastern wall are three windows representing the Trinity. 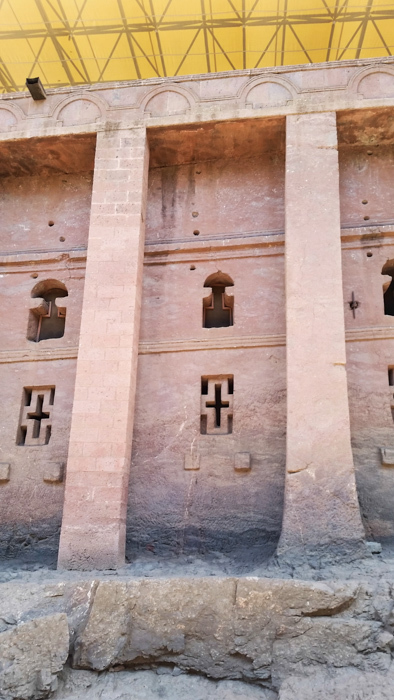 In the middle series of windows you see a cross which represents the descent of the Word into the womb of Mary represented by the third window, and the final window symbolizing the cross of crucifixion. 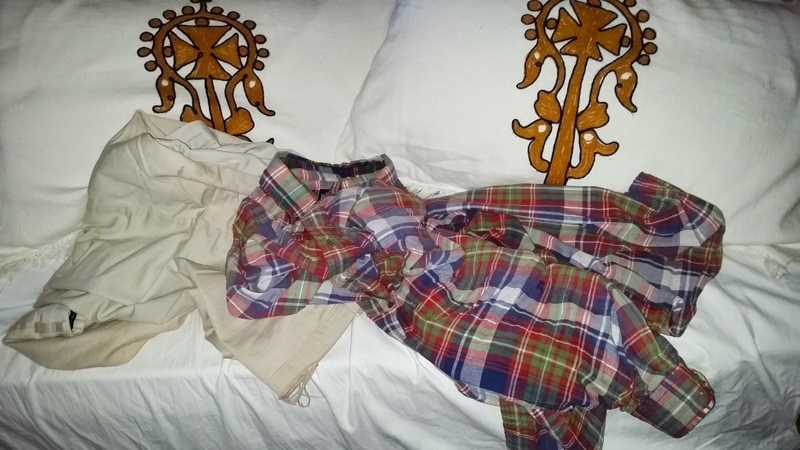 Now to the left is the cross of the good thief. 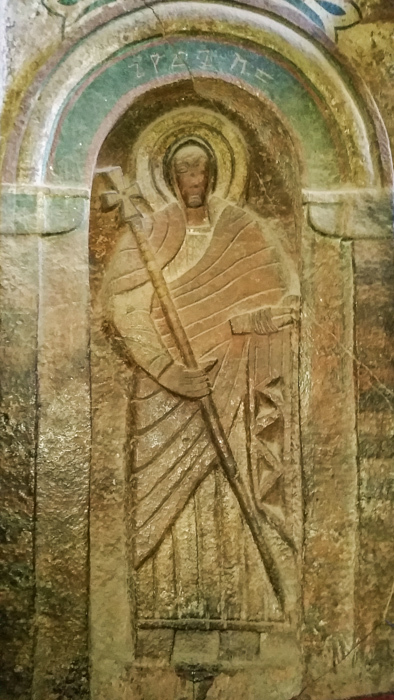 And to the left the cross of the bad thief. 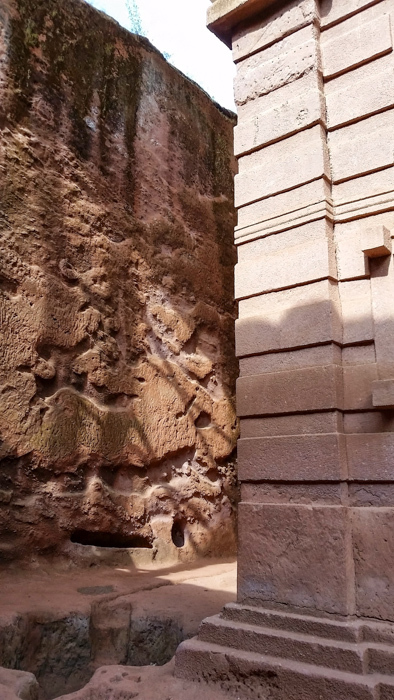 Can you see the detail that makes this distinction? 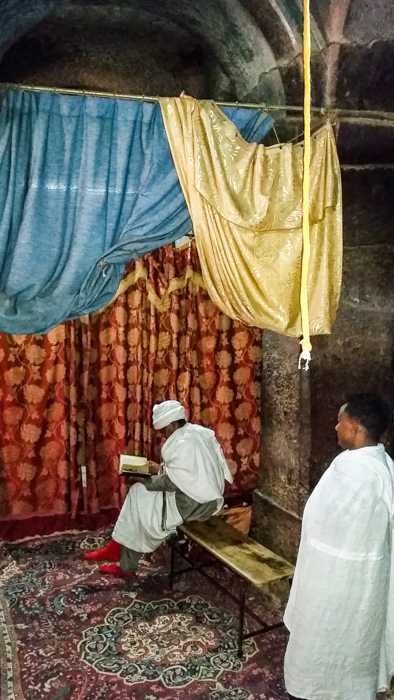 To the north is the very small chapel Bet Meskel dedicated to the Holy Cross. 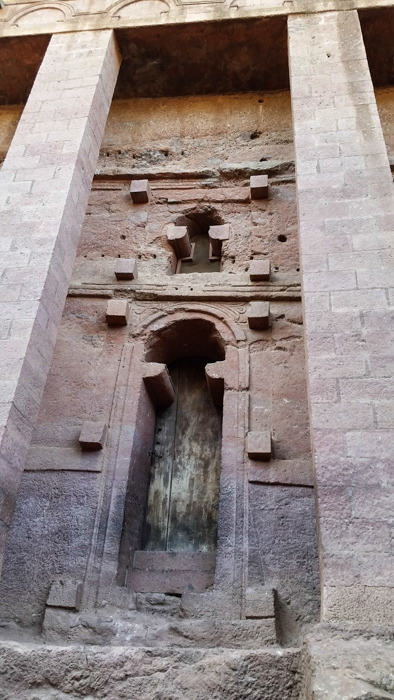 Notice 12 arcades representing the 12 apostles; and the large stone represents Sinai. 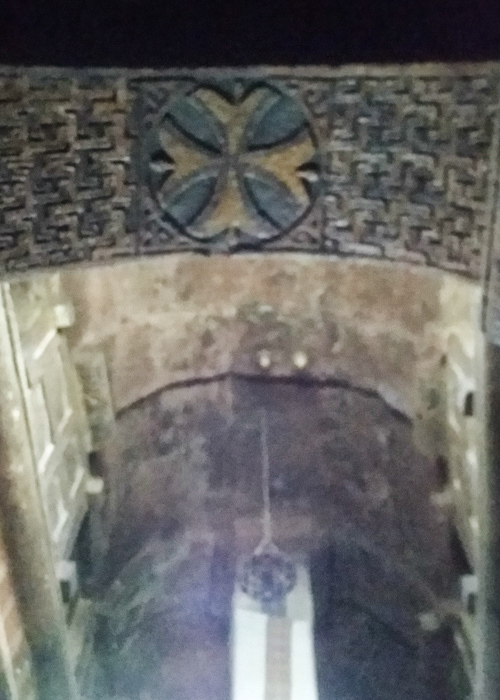 In the flat vault is the cross. 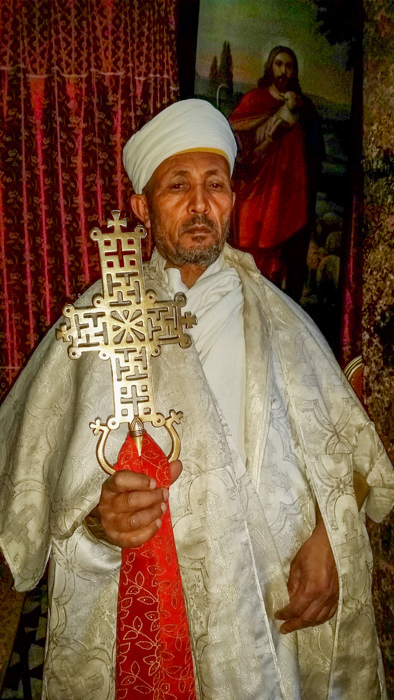 A priest proudly displays a blessing cross in the chapel. 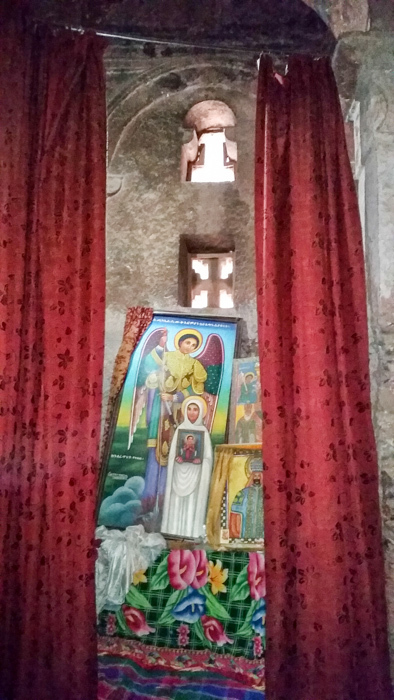 I am leaving Bet Maryam to cross over to Bet Danaghel which commemorates the martyrdom of nuns at Edessa in the 3rd century by Julian. 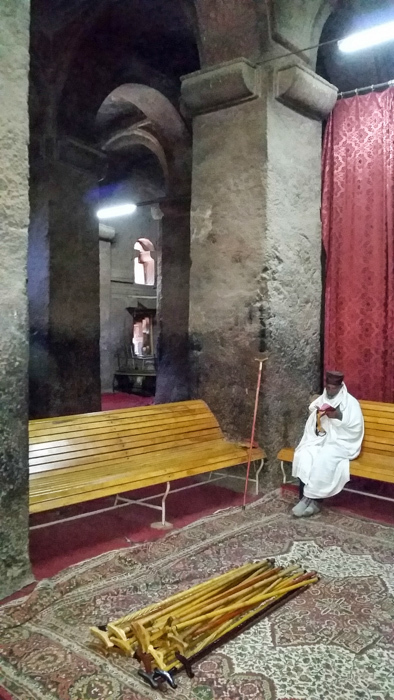 In the interior of Bet Maryam is column that is wrapped in white. 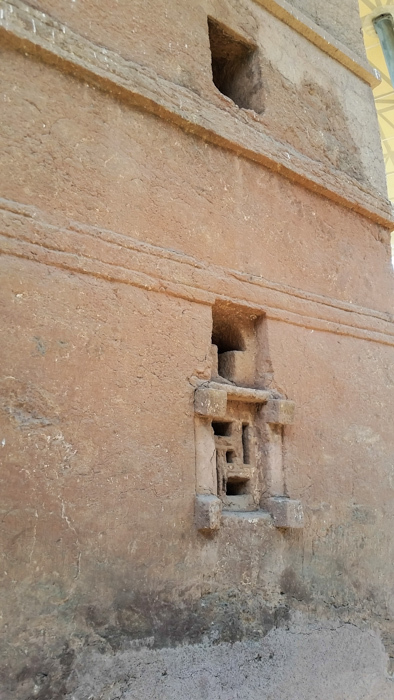 This represents the pillar of fire in the desert. 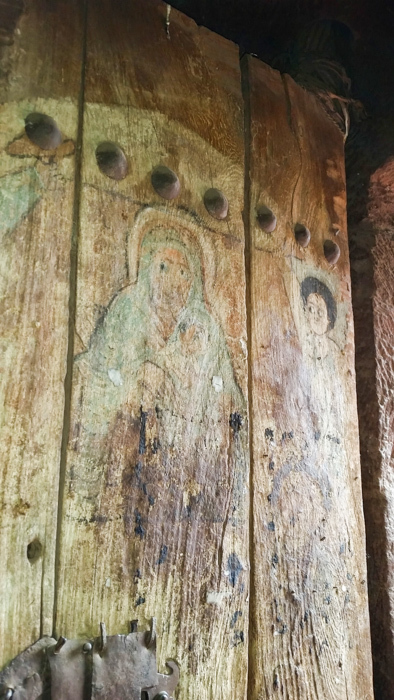 There are Greek, Hebrew and Geez inscriptions. 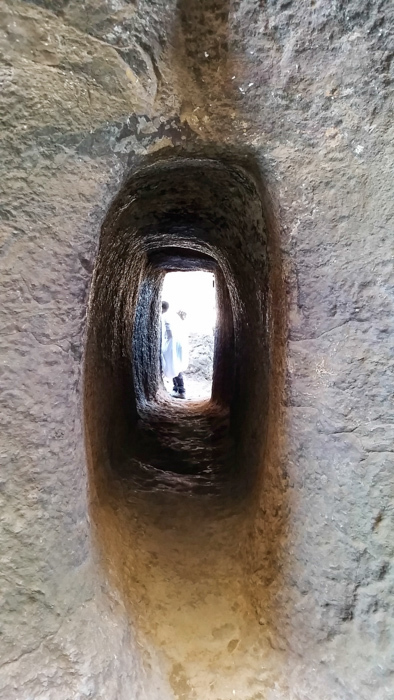 I entered Bet Golgotha. 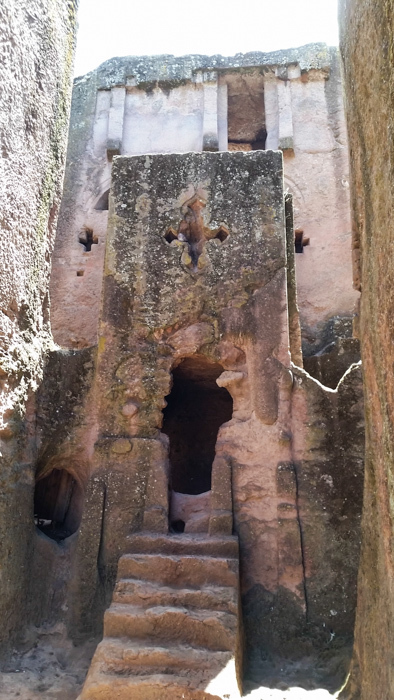 Notice the unique cruciform columns. 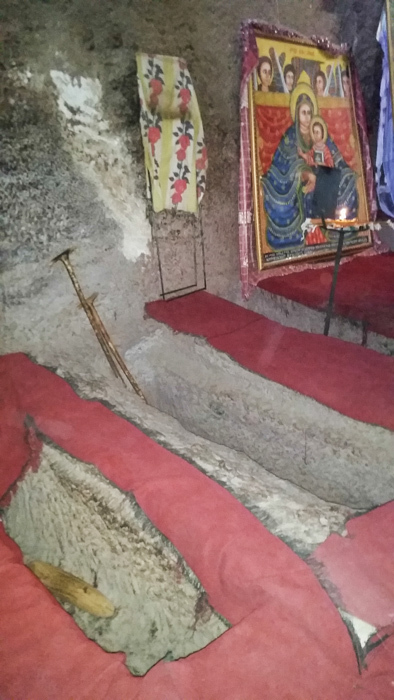 The tomb of Adam under Golgotha. 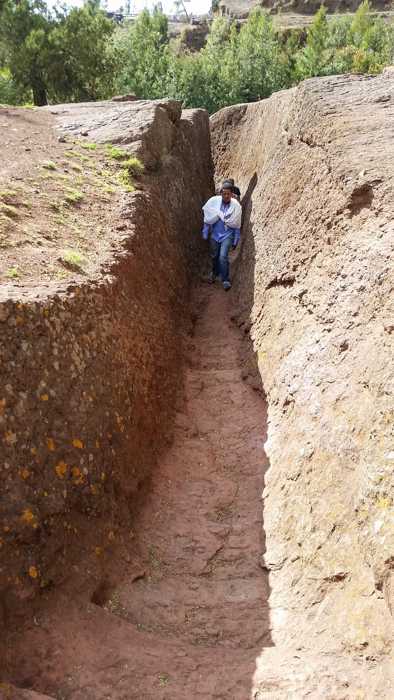 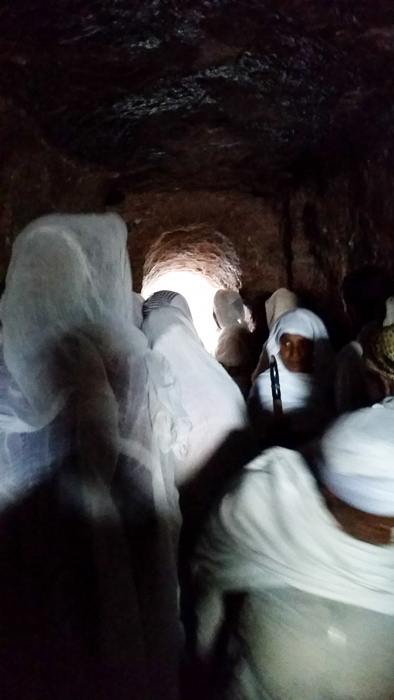 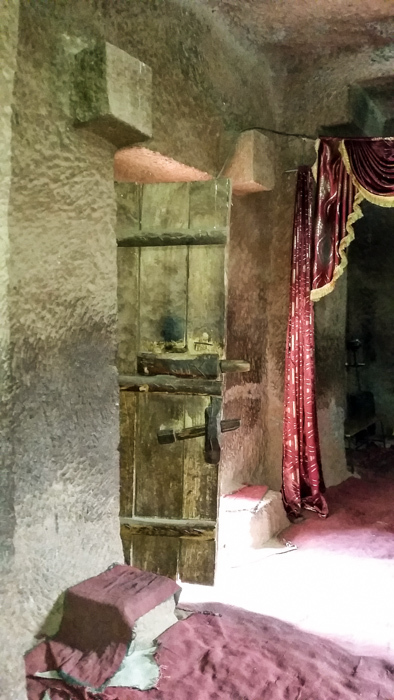 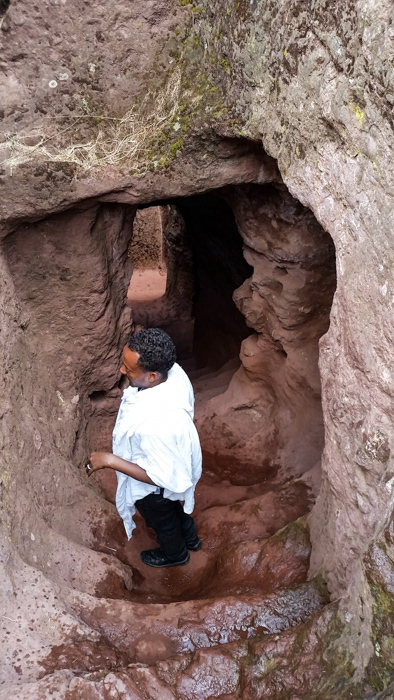 This is the original entrance to King Lalibela’s New Jerusalem. 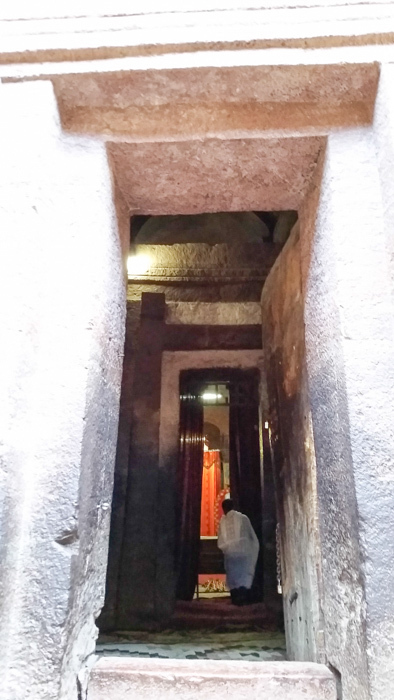 He made a pilgrimage to the Holy Land and came back and created a place of pilgrimage modelled on Jerusalem. 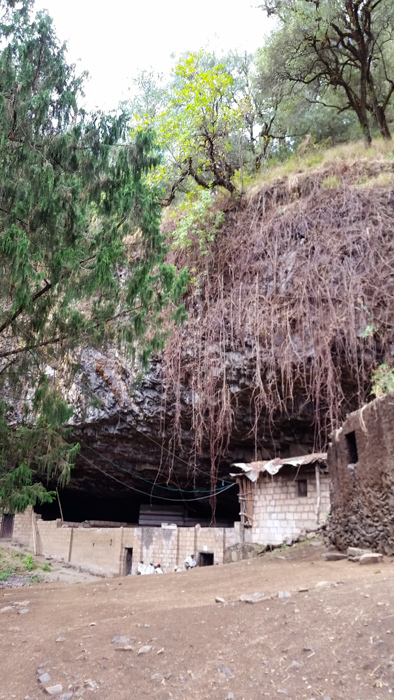 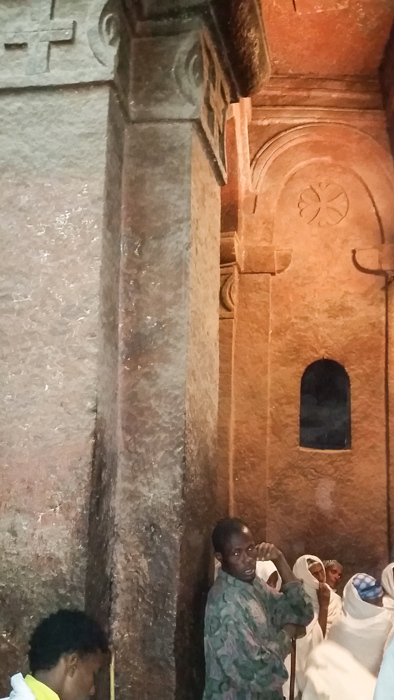 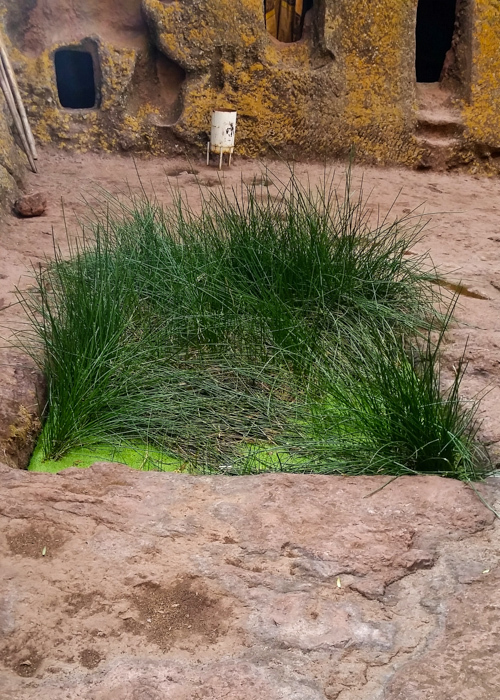 That afternoon went to Bet Naakuto Laab, built in a cave by a newphew of Lalibela. 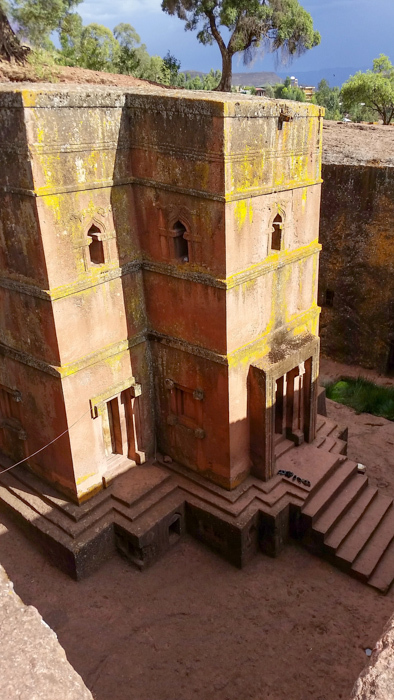 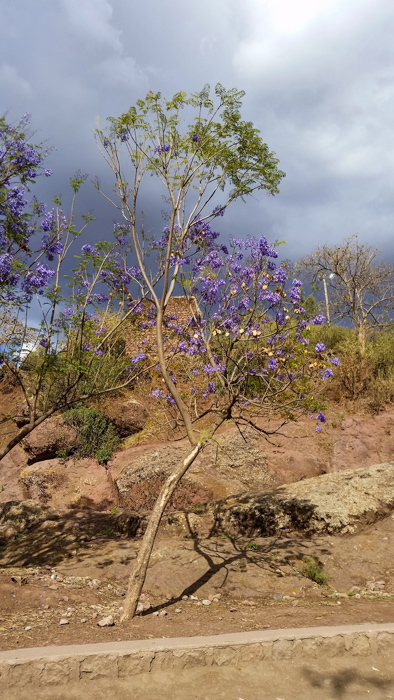 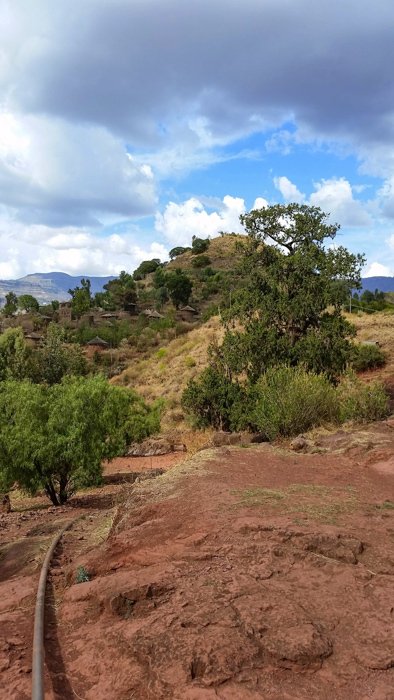 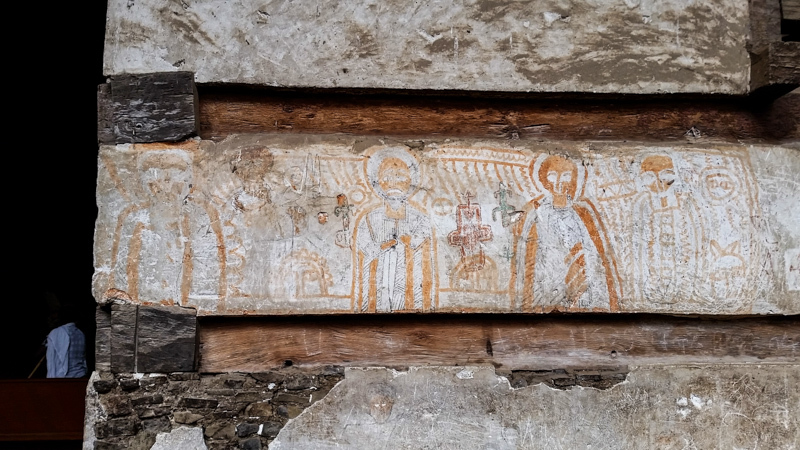 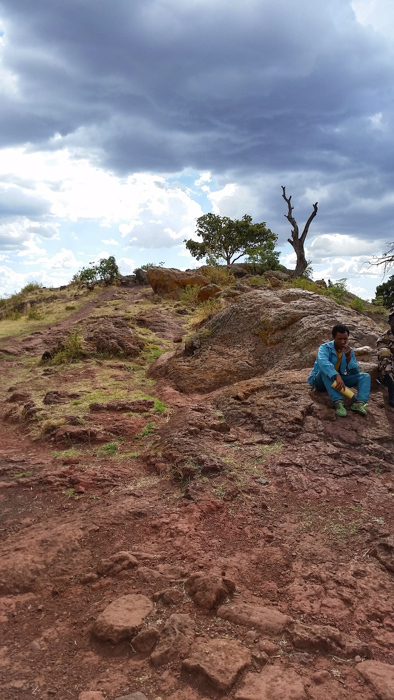 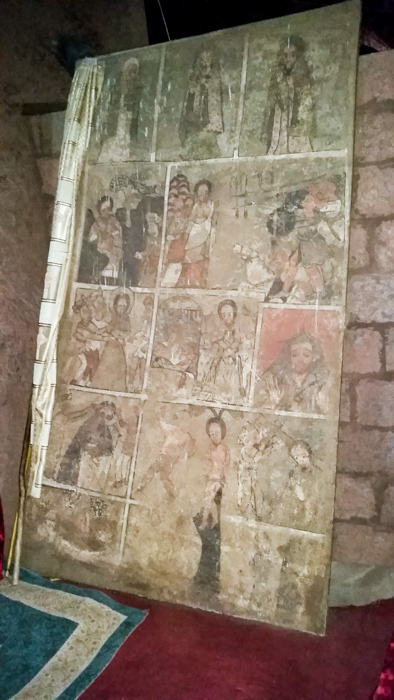 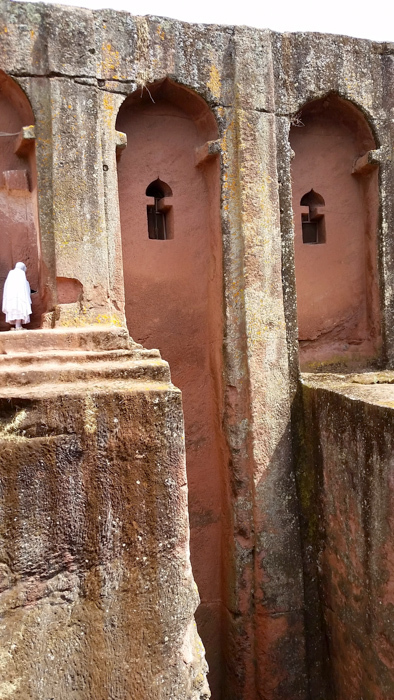 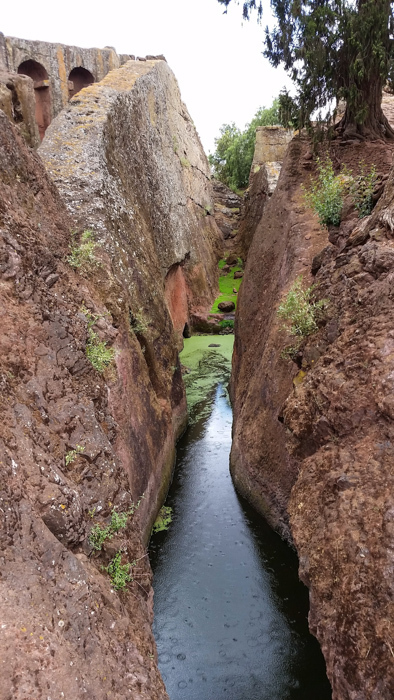 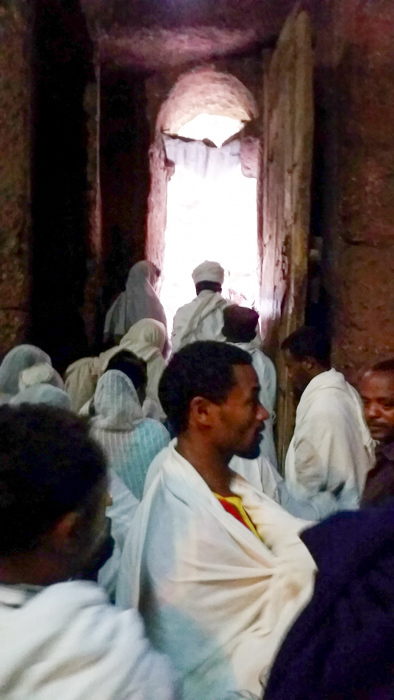 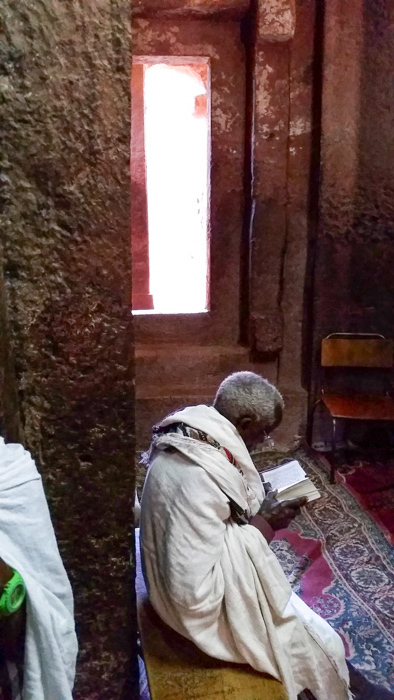 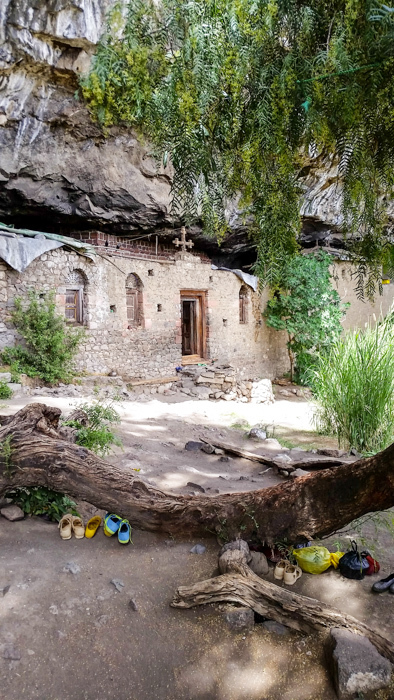 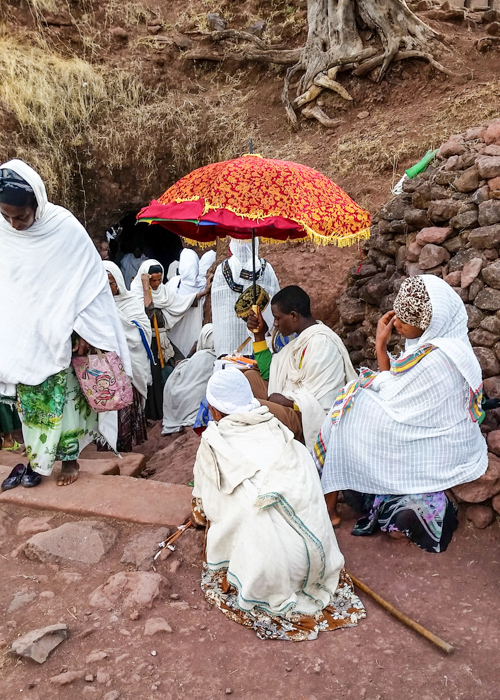 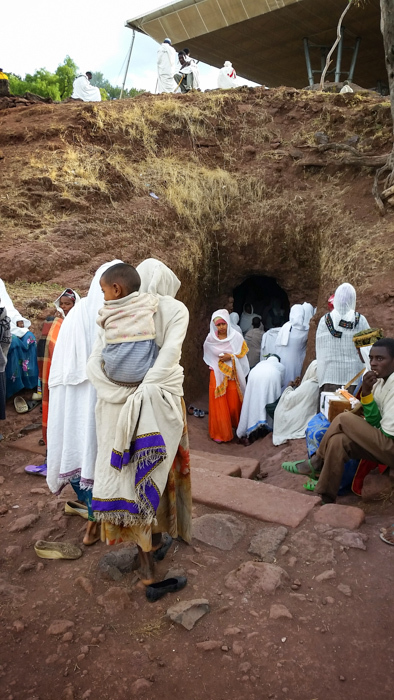 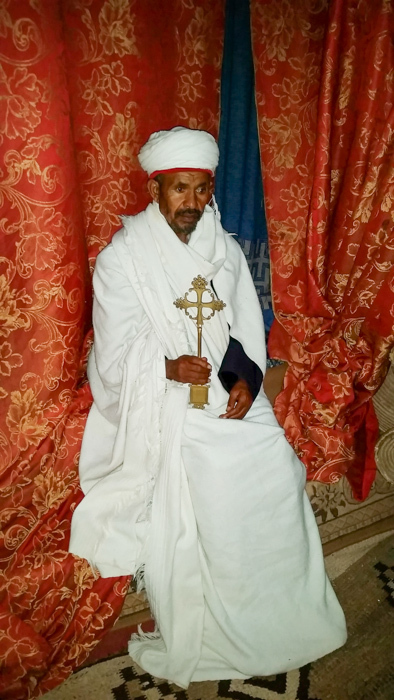 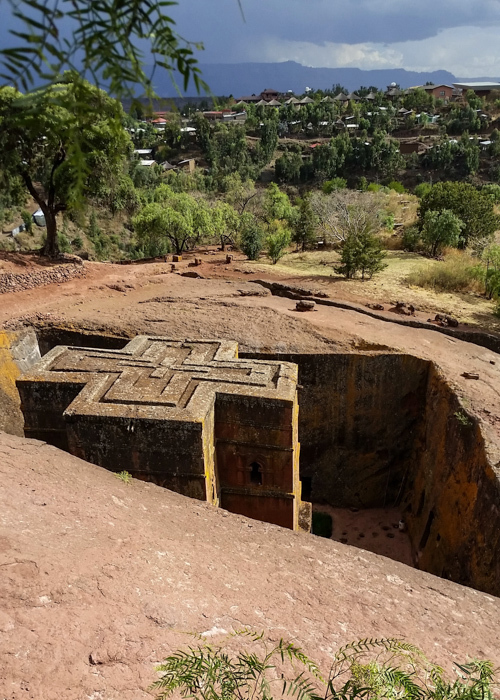 This entry was posted in Faith, Travel and tagged Christian, Ethiopia, Faith, Lalibela, rock-hewn churches, travel on March 29, 2015 by frjfkauffmann.